Predicting the future of computing, analysts are of the view that the Tablet computers would sweep the tech-era, while also forwarding a suggestion to the one and only tech giant remaining in the race, Microsoft, to jump in and mark its win while bringing a offering a tough competition on others specially the Apple’s iPad. Apple iPad, one of the most sold tablet computer worldwide hasbeen able to set a strong base for itself. Microsoft has been trying hard to roll in its share but due to some unknown reasons we register a delay each time. Each year, Microsoft announces new products running on the strong and powerful, Windows Operating System but always lagging the slate announcement. New York Times reported that the software giant would be unveiling a variety of new slates next month at the 2011 Consumer Electronics Show (CES), to be held in Las Vegas. If and only if, Microsoft announces stepping in the tablet-era, the iPad would surely be up to a competition, which has been able to gain the market share quickly. The blog further told that a close source revealed, Steve Ballmer is expected to announce a number of these devices when he takes stage at the CES, with devices built by Samsung, Dell as well as other manufacturing partners. …similar in size and shape to the Apple iPad, although it is not as thin. It also includes a unique and slick keyboard that slides out from below for easy typing. Of course, when a device by Microsoft launches how would it be complete until it runs under the Windows Operating System. It has been told that the device would be powered by a Windows 7 Operating System which would present a landscape mode and a portrait mode. 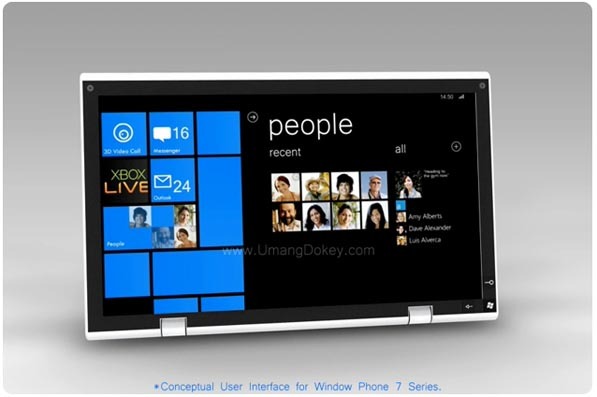 Microsoft is encouraging its partners to build applications for these devices that uses the HTML5. Moreover, the software giant has no plans to setup an App store as it plans to encourage software partners to host the applications on their own websites. Khizer Hayat Farooq, English yours is only soso believing I am. Sorry saying to be.